On January 30, 1882 Franklin Delano Roosevelt was born in Hyde Park, New York. Franklin’s family was rich. He had tutors and nannies to help raise him. In June 24, 1903 Franklin received a History degree from Harvard University. While at Harvard Franklin studied hard and played football. He also went to Law School. On March 17, 1905 Franklin got married to a lady named Eleanor Roosevelt. Together, Franklin and Eleanor had six children. In the year of 1910, Franklin was elected to the New York State Senate. He also worked as the assistant secretary of the United States Navy. In August of 1921, Franklin got a horrible disease called Polio. On November 4, 1928, Franklin D. Roosevelt was elected Governor of New York State. On November 8, 1932, Franklin was elected President of the United States. Franklin D. Roosevelt moved into office in the year of 1933. Franklin got re-elected on November 3, 1936. During this term Franklin started his new radio chat program to communicate with Americans. The programs were called Fireside Chats. November 5, 1940, President Roosevelt was again re-elected for his third term as President. 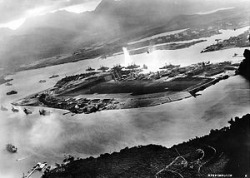 During his 3rd term Franklin asked Congress to declare war after Japan attacked Pearl Harbor. President FDR was re-elected to a fourth term. During Franklin’s fourth term, World War 2 was almost over. He attended the War-Yalta Conference to discuss building up the countries damaged during the war. It was said that while Franklin was getting his portrait painted he complained of a headache. He then fell unconscious and soon passed away. On April 12, 1945, Franklin Delano Roosevelt died in Warm Springs, Georgia. On April 15, 1945, Franklin Delano Roosevelt was buried in Hyde Park, New York. 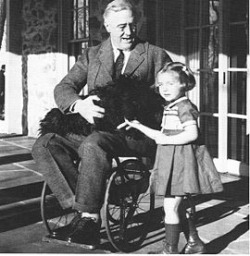 Franklin D. Roosevelt was a great hero to groups such as African Americans, Catholics, and Jews. While working with Congress, Franklin D. Roosevelt created programs and jobs to help Americans who were suffering because of the Great Depression. His most famous and successful program was called the New Deal. During the New Deal, Franklin made sure that African Americans fared well. 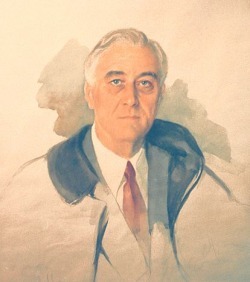 Franklin D. Roosevelt was highly successful at attracting large majorities of African Americans, Jews, and Catholics into his New Deal programs. President Roosevelt gave orders to make sure racial, religious, and ethnic minorities were able to get some of the wartime jobs. Franklin tried his best and worked hard to make sure that African Americans could have much better jobs in the military. When Roosevelt took office, the U.S. was going through the Great Depression. During this time many Americans did not have jobs, food, or homes. These were the worst times the United States of America had ever had to face. President Roosevelt had a huge job ahead of him as the new president of the country. -Franklin D. Roosevelt’s mother must have loved her dogs, because she’d send them postcards when she went on vacations. -Franklin’s mother made him wear a dress until he was five. -Franklin and Eleanor got married in 1905 and were distant cousins. -People proved that Franklin D. Roosevelt was related to: George Washington, John Adams, James Madison, John Quincy Adams, Martin Van Buren, William Henry Harrison, Zachary Taylor, Ulysses S. Grant, Benjamin Harrison, Theodore Roosevelt, and William Howard Taft. -In 1933 Franklin D. Roosevelt declared that "Home on the Range" was his favorite song. -Someone once tried to assassinate Franklin in February, 1933. Roosevelt was not hurt, but they killed Anton Cermak who was the mayor of Chicago. -When the King and Queen of England came to visit Franklin and Eleanor, Eleanor cooked hotdogs and Franklin served them. -Franklin and Eleanor Roosevelt’s dog, Major, once bit the British Prime Minister, Ramsey McDonald. -In 1935 all plane flights over the White House were banned, because President Roosevelt could not sleep. -Franklin was the very first president to have the use of air conditioning in the White House. -He also was the first president to have been seen on television. -It was said that all five of Franklin’s children have been divorced. - FDR said that his favorite food was fried cornmeal mush. 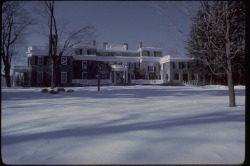 Franklin loved and admired his home in Hyde Park, New York. He started the first US Presidential Library here. It is now used as a historical site where people go to learn about the President that served 4 terms. “All that is within me cries out to go back to my home on the Hudson River” FDR. 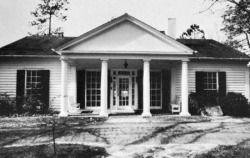 This is the "Little White House" located in Warm Springs, Georgia. This is where his family would go to help him recover from polio. This is also where Franklin passed away.